Hello dear Quick Quotes friends. My name is Irit and this is my tutorial made especially for Quick Quotes readers. This is my own 'no glue' way to add small and cheap beads over bare chipboard to get this shiny & unique look using acrylic paints only. 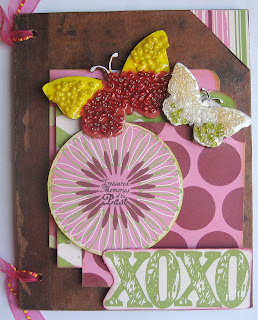 You can use pre-made chipboard pieces or die cut your own. *TIP: the chipboard needs to be thick since we use a large amount of paint & beads on top of it. STEP 1: Cover your bare chipboard with a thick layer of acrylic paint. 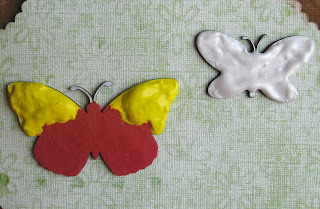 You can use a metal acrylic, as I did with my white butterfly or you may use 2 (or even more colors) of acrylic as I did with my second red & yellow butterfly. Keep your beads close by, as you don't have much time during this step. STEP 2: Add your beads randomly over the wet paint. Use one or more colors and don't be afraid to keep adding more until your paint is almost completely covered with beads. Let it dry completely (approx. 2-3 hours). 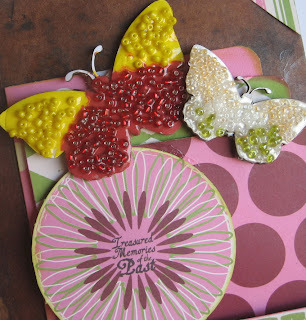 STEP 3: Add some clear crystal glaze over your beaded embellishments. I used Ranger's Glossy Accents, but it can be any type of glaze used for this step. 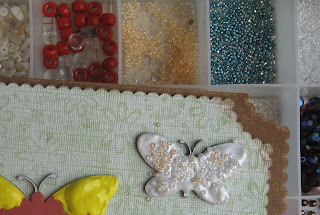 Let it dry over night and your beaded accent will be ready to add to any project! My project shown above is an altered mini-book made with Quick Quotes' Tessa's Fairytale papers and die cuts. I hope you've enjoyed this tutorial & will try this technique with your chipboard! Very cool idea...thank you for sharing!